If this year isn't careful, it'll get a ticket for speeding! You'll be pleased to hear I've managed to have a whole day a week just for Art. Well, I'm pleased anyway! I've been creating ATCs (Artist Trading Cards to swap and collect), greeting cards, drawing, painting (practising watercolours) and learning to scrapbook pages (they're not that different to ATCs, just a tad larger). Luckily for me, my favourite art and scrapbooking shop, Abundantias Gold is not far away, and they've endless support, ideas and inspiration. Having a day a week just for art has created a calm and relaxed lifestyle, just the way life should be. And although I love my work, its so good to be making art a priority. All I have to do now is fit back in photography, animation and of course, more time in Redbubble. Do you love Australian wildlife? What about quilting and embroidery? You'll love this book by Betty Johnston. She not only created an incredible handstitched Australian quilt, but she's also turned into an amazing book. 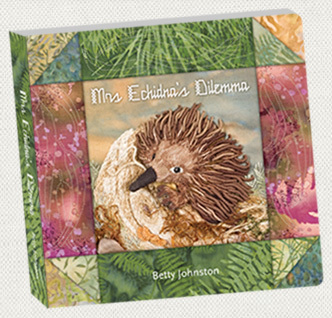 Both the book and the quilt tell the story of a beautiful echidna and her search for a suitable home. Its called Mrs Echidna's Dilemma and although a board book, its for all ages and all walks of life. Every home, school and library in Australia should have a copy of this amazing book. Redbubble is growing and improving constantly... the talent over there is so incredible. If you haven't had a look yet, why not start by visiting this amazing collaboration? The Superheroes Childrens Alphabet Gallery or go for a quick read of unique fiction.